Prospective college students are all too aware of the pressure that comes with choosing the “right” school. Those opting for an education in the competitive world of music have the added pressure of finding a school that will not only develop their skills, but also put them on display. In Northfield, MN, the music students of Carleton College now have the advantage of a single location to learn, practice and perform thanks to the school’s new Music and Performance Commons. The building, which stands adjacent to the campus’s other arts buildings, includes a 400-seat theater, as well as rehearsal rooms and classrooms. 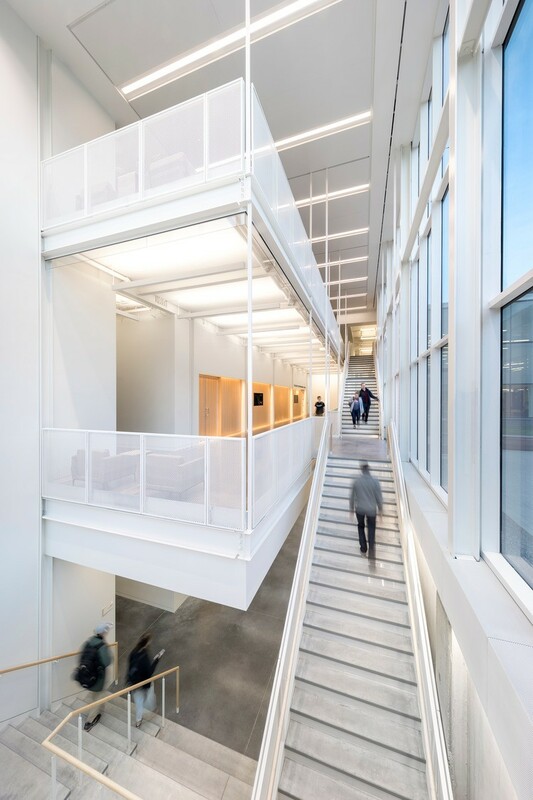 “The client wanted to make a building that would attract students to Carleton College, that would excite them about the art-related amenities that they have there,” says lead lighting designer Christa Belasco of HGA (Minneapolis). Along with fellow lead designer Paul Whitaker of Schuler Shook, Belasco spent two years (2015-2017) creating a space that would act as an inspiring mecca for all of the art departments on campus while remaining focused on the school’s music and dance endeavors. A flexible design that allows numerous spaces in the 55,000-sq ft building to transition for various functions and performances unites the different disciplines within the existing building. “They really wanted this to be a place that would encourage cross-disciplinary collaboration between all of the different art students,” says Belasco, who tailored the main lobby to showcase student artwork. “The heart of the project was the performance hall,” says Whitaker, who focused on the hall and the building’s rehearsal rooms when working with Belasco. To support the hall’s acoustic needs, tracking curtains capable of extending to diffuse sound from larger ensembles and amplified music were included along the sidewalls. An acoustically transparent wall surface consisting of a wood lattice wall with a gold metal mesh window screen is used to hide the curtains. “When you pull the curtains out it looks completely different,” says Whitaker. “We decided early on that we wanted to create a lighting effect within the sidewall assembly, so we ended up putting a vertical strip of color-changing LED tape behind that wood panel that illuminates that gold mesh screen. The light on gold mesh completely changes the color of the room.” The lights can be used in a multitude of ways, including changing colors in time with different pieces of music. “When they do dance performances, jazz or electronic-music performances they really activate those panels and make them a part of the lighting of the show,” continues Whitaker. Suspended LED cylinders set to 2700K and recessed downlights provide ambient lighting above the seating and stage while accentuating the front of the wooden sidewall panels. “A beautiful feature of the rooms is if you don’t have the LED lights on, it’s a very traditional wood concert hall with a beautiful wood surround. When you turn on the LED lighting behind the wood lattice you can instantly transform the room to match the performance on stage,” says Whitaker. 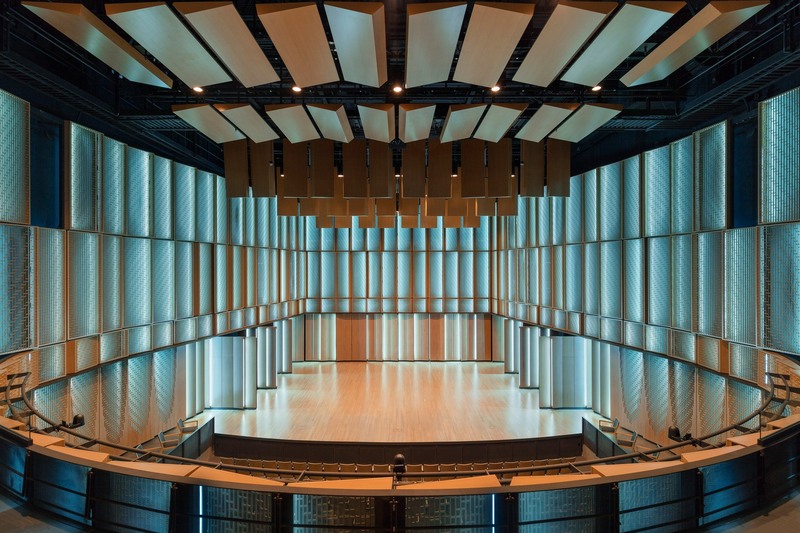 To support performance genres outside of classical music, sidewall and ceiling panels rotate to optimize acoustics. Between the rotated ceiling panels, electric pipe battens with theatrical light fixtures can lower to provide more robust stage lighting for more elaborate theatrical presentations. 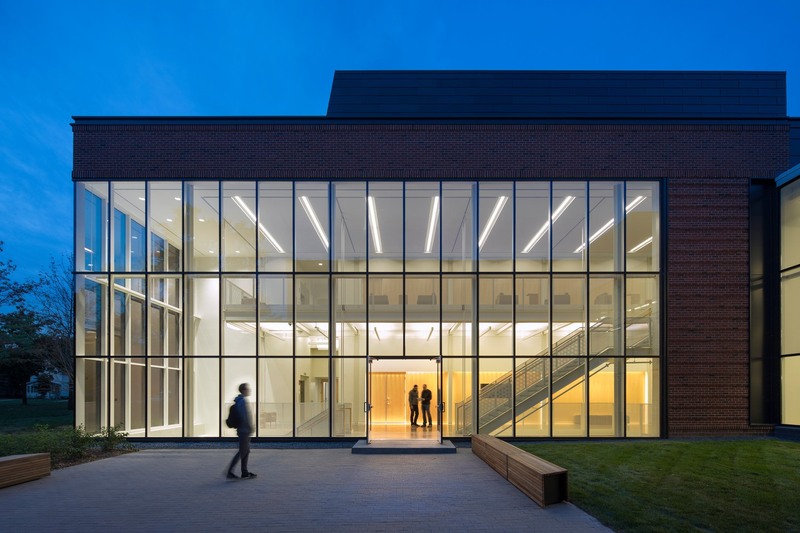 The lobby acts as a transition between the industrial and exposed aesthetic of the existing arts buildings on campus and the warm and enveloping environment of the performance hall. “We kept things clean, open and modern in the lobby, but we also started to introduce some of the wood materials and warmer color temperatures as patrons get closer to entering the hall space,” says Belasco. The space features linear lighting (3500K) that responds to the modified ceiling design of each level, while cove lighting (2700K) highlights pocketed golden wood walls. Track lighting, softly illuminated wall coves, linear wall-wash lights, and adjustable downlights in the three story stairwell all highlight student artwork. Dimmable all-LED lighting and preset controls allow scenes to be tailored for events while also helping the building come in 33 percent below Minnesota’s energy code (IECC 2012). “Another building on campus had been LEED Silver certified, so we wanted to meet that same level of sustainability,” recalls Belasco. Beyond the lobby, open rehearsal spaces give a nod to the performance hall with accent lights and wooden panels in lighter shades hung from the ceiling. Paired with large windows displaying the campus, the rooms are a bright and minimalist interpretation of the building’s overall aesthetic. Theatrical fixtures in the choir rehearsal room enable the space to convert to a small recital hall and DMX cylinders provide general lighting for classroom and performance functions. 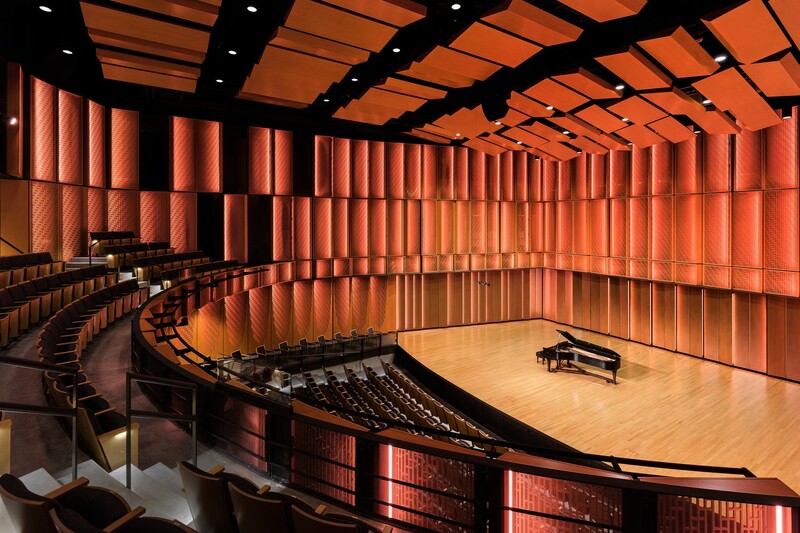 The lighting controls for the recital hall allow for easy everyday use and simple maintenance settings, as well as more sophisticated programming for performances.